The locus of innovation in handset design, product planning and market strategy has moved its center away from the erstwhile first world to the former developing world i.e. India and China. The implications of this positioning are enormous, particularly given the conventional wisdom currently prevalent in the industry that the latest, greatest, cutting edge technology is a much sought after premium piece of hardware. What are the current manifestations of this seismic shift in the source and diffusion patterns of innovation? The era of the Apple product/pricepoint strategy is over for everyone, including Apple. Big ticket flagship devices released to much fanfare and the lining up around corners by fanbois may still continue to work for Apple but even for them the size of this target market has reached its limit. That is, they’ve captured all they could of the share of the market likely to rush out to buy the latest, greatest shiny at whatever price. Markets with the biggest growth opportunity are extremely price sensitive, which IDC believes will not change, and this is the main reason Apple will be challenged to take Android share throughout the forecast. Even if Apple were to introduce another low-cost iPhone (e.g., C version), IDC believes the price will struggle to compete with Android OEMs that are focused on portfolios aimed at price points of $200 and less. This isn’t to suggest that Apple’s success with the iPhone won’t continue, and IDC believes its efforts to maintain significantly higher margins compared to its competitors are much more valuable than chasing share. The implication is that new entrants should focus on the “cheap smartphone for poor Africans or Indians” shtick. But this would be the biggest mistake any self respecting brand could make. The entry level segment is completely saturated with Shenzen makes, refurbs, grey market boxes, and a hodge podge of low end models from all and sundry. This is the commodification we saw coming 6 years ago. Here is where I see an opportunity for a maverick like Xiaomi to capitalize on Hugo Barra’s statement that innovation is not a luxury but for everyone. The growth markets might be price sensitive but they’re neither stupid nor resigned to their fate. Whether it was the poor man’s car – the Tata Nano, or the slew of wellmeaning first worlder’s introducing frugal low cost technology for the social and economic wellbeing of the downtrodden, the downtrodden have turned up their noses to it all. Not since Nokia’s heydays has any brand succeeded by flaunting its low cost solution as its USP – and Nokia never flaunted their affordability, they just ran a truck over their phones and let you make a call after. You couldn’t help but realize it was worth the price, offering the biggest bang for your buck. Many of us still reminisce over teh good old days of long lasting battery power and rugged Finnish engineering. In the past 10 years, everything has been changed by the rise of the internet and proliferation of social media. The connected consumer’s aspirations have found their own level, like water, on a global scale. There is no tradeoff to be made if you’re in the market for a new smartphone. This is the result of the democratization of design, exemplified by Xiaomi, and the result of the race to the bottom of the pyramid. Growth markets are part of the prepaid economy, and the considerations around brand positioning, price point and marketing strategy are not what you have been led to expect. Here are most demanding customers on earth, operating in the most challenging environment. The mass majority for mobile phones isn’t localized anymore, not even on a regional or continental level – its global. And this is tailor made for affordable innovation, a customer experience that makes you feel as special and as unique as any fanboi without the accompanying price tag. Only two to three years ago, Xiaomi was just a copycat. Ignoring Xiaomi’s ambitions is a big reason why Samsung is now facing a crisis. Now, we have to ask serious questions: “Who are you, Xiaomi?” and “Where are you going?” Only when we figure out the answers will we know where we will be heading, too. Just a quick search to see where they’re going offers up such tidbits as ordering a new Xiaomi phone online to be delivered by Uber. Who they are is what their competition isn’t – an opportunity seeking conglomerate leveraging gaps in the innovation ecosystem. Business models, marketing, distribution, design planning – they are re-inventing the conventional to suit the flexible, social, frugal world of the prepaid economy’s connected consumers. Its a whole new ballgame. As I said 10 months ago, the era of big brand cellphones manufacturers is over. This isn’t a new diagram for anyone familiar with my writing. 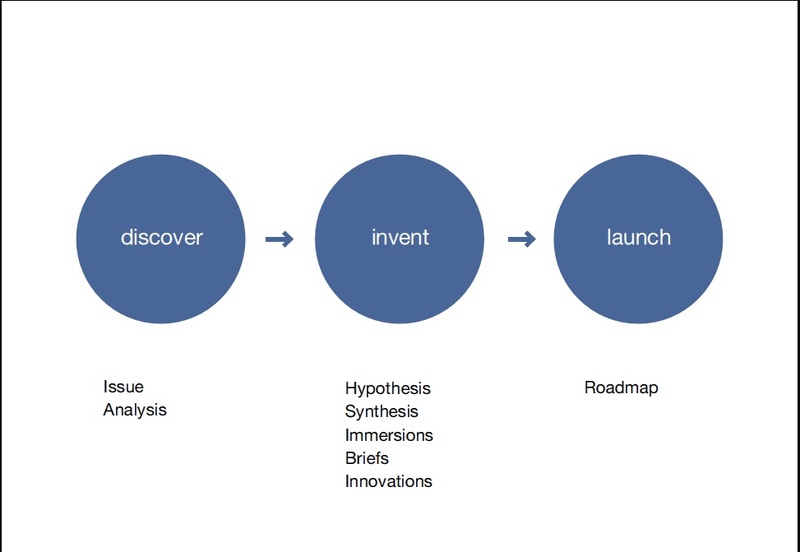 Its a diagram I’ve been using to explain where my work fits into the innovation development process since I first saw it on Luke Wroblewski’s blog back in 2006. However, I’ve just been struck forcibly by the realization that there’s a very important piece of this process that’s missing. And that is Interpretation. What do I mean by Interpretation? Lets start by taking a look at the ever popular user centered design process, simplified in linear form, although we all know there are numerous feedback loops and iterations constantly happening in real time. The understanding we seek in order to conceptualize and design emerges from the immersion in the new operating environment we wish to enter. This where we go and meet people and talk to them and watch and listen and learn. Its when we get back and analyse our findings that our aim is to synthesize them in the form of actionable insights that can drive the design and development of a new product, service or business model. The space between Insights and Design is when and where we conceive the ideas we wish to develop into workable constructs. Its a given that the process isn’t as linear as diagrammed and ideas and concepts occur much earlier but what is critical, and this is what I realized today, is in how we interpret our findings from the field. This is the bit I’ve circled in red. This is where our assumptions, especially those we don’t recognize, and our presumptions, are most likely to let us down. Two people, present in the same user observation study, meeting and listening to the same people, can interpret the raw data in very different ways. So much of this has to do with our preconceived ideas of the target audience not to mention especially important when you’re looking at such a study in a culture and society very different from your own, that its no wonder specialists in the field of design ethnography or user research keep emphasizing the need to able to step outside of yourself in order to observe and understand someone else. While this is naturally important in all kinds of human interaction, it becomes far more crucial in the context of a professional user research project. That’s why there are any number of case studies and examples of products and services that fail to match people’s needs or meet expectations *even* after extensive and expensive exploratory user research studies. Did we manage to interpret our findings correctly? Did we understand what someone was saying in the context of their own culture and mindset and society? Or did we interpret their words and actions from the perspective of our own frame of reference? I’ll end this with a simple example that comes to mind as I write this. A couple of years ago I was in the field for a small solar power manufacturer who could not comprehend why the very sensible decision of being able to save oodles of money on kerosene by investing in an affordable solar lamp was not being made by his intended target audience. Why were they not purchasing this product even though it made so much sense to do so? In fact, it turned out, the real question was, did it make sense to the potential customer in the context of their own cash flow, income stream and household management? Yesterday I came across a post on The World Bank’s blog, “Design Thinking for Government Services: What happens when the past limits our vision of the future?” Given that I’m in the process of writing a report on the role that human centered design can play in government, that too for a developed nation, I’d like to take this timely opportunity to deconstruct the concept and reflect upon it further. We can either: (a) use statistics, trends, quantitative surveys, and historical data to produce reliable results; or (b) develop a deep understanding of the basic needs of end users for the specific problem that needs to be tackled and propose a valid solution that would satisfy these needs. The author makes a very good case for validity, which is usually forgotten by companies that prefer reliable results that keep most companies’ top executives and stock analysts at ease. 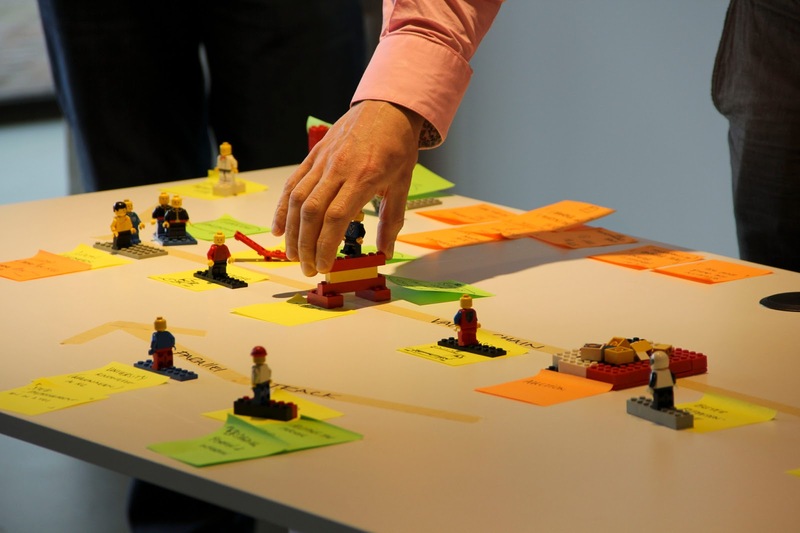 This call for a change on how to tackle innovation has originally been directed to businesses, and takes the concept of design thinking (that is, borrowing the thinking process of designers) to services and companies in general. However, I believe it should also be applied to governments, more specifically on how governments should take advantage of ICTs to improve service provision internally (within government entities) and to citizens. While the author has indeed noted in the footnotes that the design process has been simplified, imho the situation as framed is not as simple as that. I’d like to take a step even further back into the basics and look upon the system holistically in order to frame my own thinking on this topic. He separated “direct design” in which a craftsperson works on the artifact to “indirect design” in which a design first creates a representation of the artifact, separating design from production in more complex situations. Doblin and others were responding to the increased specialization of design and the complexity of managing large design programs for corporations. It was a natural process to begin to discuss how design should move upstream to be involved with the specifications of problems, not only in the traditional mode of production which design had been practiced. Government is by virtue of its nature a large and complex system. To leap forward into the intuitive, empathetic mind state of a human centered designer without a rigorous methodology for analysis, synthesis and subsequent planning would be far riskier indeed than to offer stakeholders the tools to empower their decision making for more impactful outcomes. Going back to Roger Martin’s words quoted by The World Bank author, develop a deep understanding of the basic needs of end users for the specific problem that needs to be tackled and propose a valid solution that would satisfy these needs, the critical part missing in this proposed embedding of design thinking is the answer to the question How to tackle and propose a valid solution? And it is this How? that the steps undertaken prior to the design and development of a solution can offer the tools to answer, for they begin first by attempting to understand the complexity of the situation in order to identify and frame the problem to be solved by the design processes and methods. Until then, the concept as currently articulated will remain the purview of professional designers applying their approach to problem solving on the behalf of governments and international institutions such as The World Bank. That may fit in within the author’s articulation of “borrowing” the thinking but in real world terms, the steps of the process are not within any government’s ability to execute. They are not Nokia, to quote on of our interviewees, able to field a team of user researchers each time they seek to craft a programme for end-users (citizens). What government actually needs is a set of tools that empower policy makers, advisors and planners to identify the correct problems where intervention is required and then to craft programmes that meet these needs. This aligns the intent with the actions undertaken and thus improves the impact of the outcomes. In the jargon of business and design, that could be said to be improving the success rate of an innovative product or a service in the market by lowering the barriers to adoption by the end users by offering them a clearly realized value or meeting an unmet need. And, that is the fundamental premise of the human centered design approach to solution development. But those of you familiar with the application in the practice of user centred design will recognize that this section applies to the design planning phase, prior to the design and development of the first prototype, boxed up here as “implementation”. You’ll also note that “User research” or rather, “Immersion” in the field, is left implicit, although one can say that it is represented by the green circle. Exploring as I was, back then, the intersection of where design met business, I felt this diagram was limited in its ability to communicate what really happened, much less why or how. So I decided to consider how to frame design activities in all disciplines, to discover which ones were worthy of placing on my map, could be the process one takes to set about producing a designed solution. I think in its most basic and fundamental form, the process of design that one embarks upon, can be seen in three steps/stages/phases (whatever): Abstract, Concept & Design. At first there is a sort of theoretical, not yet in existence, essence of a thought, state or problem solution. As designers, we set about to bring that abstract state into a concept, something that can be communicated, perhaps visualized, definitely discusses and shaped. The final stage is the design of the concept, into the form, solution or final presentation of the concept. I’m not sure if you were to have stood at Fort Point in San Francisco at around 1827, and said “We need a bridge to get over there” if that is a fair description of the Abstract, phase – but its about the time a typographer decides to start their first sketches of a typeface that it shifts from being abstract into a concept. At a firm like IDEO, all design starts with a healthy amount of messing around in the abstract. Human Factors leads their approach to framing a design concept and problem – and they clearly (like others too) excel at bridging any gaps between these three phases, and at including the client, their customers and designers in the process. 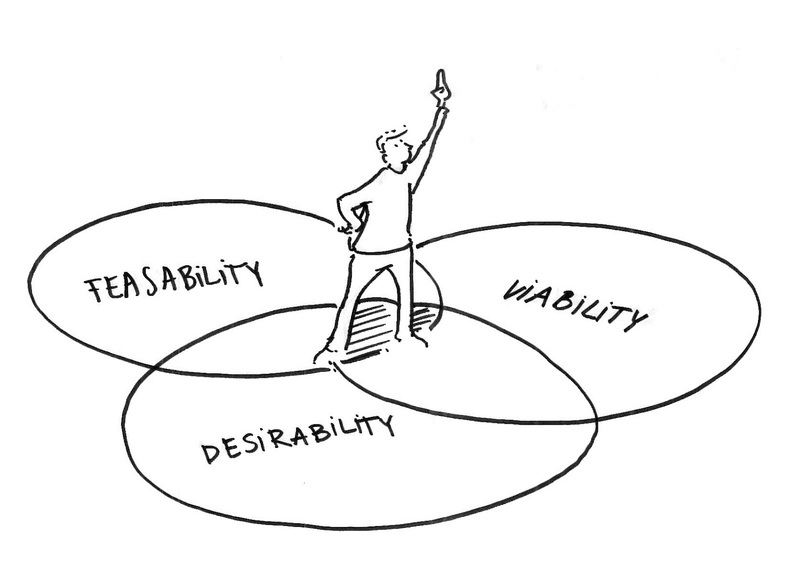 This squiggle was in response to this post of mine from August 2005, Design vs Design thinking where I’d first attempted to distinguish between the tangible role of a human centered designer and those who were inspired by the human centered design process for business strategy and planning. But, as experienced practitioners and thinkers on the messy, chaotic, non linear creativity inherent in these activities will recognize immediately, the squiggle is too implicit to help communicate the process with clarity to audiences without exposure to the process, such as your typical client organization or institution. Linear, structured thinkers need to feel confident they understand what you are planning to do and how you’ll go about it before they’ll sign a check. Quite a few circular arrows are missing from the How? and Next? 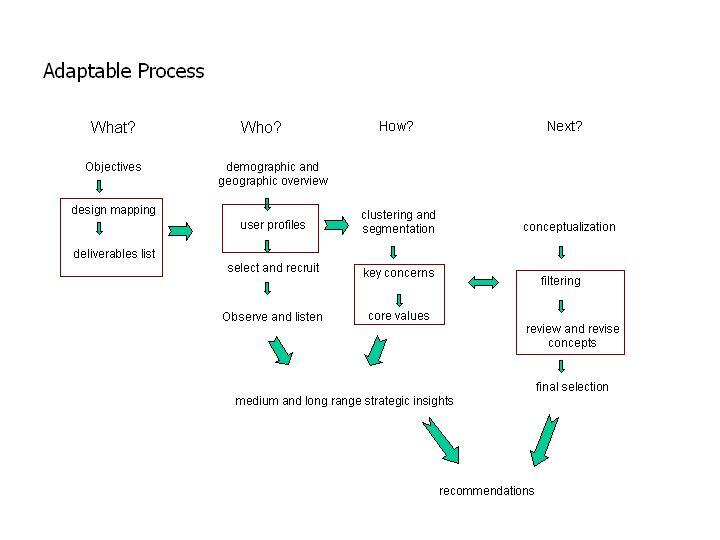 phases here as it attempted to frame the bullet points from process description into a visual format. Now I hope that with the help of excellent visual thinkers involved in our current project, there is a chance that this process can be greatly improved. This article focuses on strategic alliances, in which one firm (normally a large, multi-product corporation) obtains critical product-development resources, such as design or technological know-how, from an independent firm (normally a smaller and more specialized design consultancy or a technology developer). The two firms develop a fairly close relationship—perhaps only for the period of a specific assignment, but often over a longer period spanning several projects. These hybrid relationships are governed through informal means, such as unwritten agreements between key individuals, as much as through the more usual form of legal contracts. Crucial to the success of a hybrid are “boundary-spanners.” These are members of the partner organizations who are able to move freely within both, translating the requirements of each into language and behavior that is acceptable to, and understandable by, the other. Trust between the senior managers who set up a hybrid in the first place, and the boundary spanners who maintain the relationship subsequently, is a critical factor. Trust lowers cost and raises productivity. Cooperation increases under conditions of trust, because with trust such costly barriers as formal contracts and detailed monitoring can be removed. The resulting less-formal specifications can also allow the parties to respond more rapidly to any changes in circumstances. Hybrids protect the smaller firm from the stifling effects of the larger firm, while allowing its creative knowledge to be exploited. This happens through what is, in effect, a “semi-permeable membrane” in which certain features are blocked from movement while others are transferred. Boundary-spanners, or bridgers, as they are sometimes described, are people who move between both organizations, translating the norms of each into language and behavior that are acceptable to, and understandable by, the other. There is almost no research on the role that boundary-spanners have in hybrid organizational structures, and yet they are likely to be one of the most important factors in the success of those structures. After all, new product development is a social-, collaborative-, and interaction- intensive process involving experimentation and negotiation over the lifecycle of the new product’s evolving form, bringing together knowledge, expertise, and technologies from different sources into a whole. Learning involves the negotiated resolution of constraints and generates new knowledge, which may then be embedded in the design of new technologies, products, or processes. Thus boundary-spanners need to be skilled first of all in the nuances of creating a new product. A perfect example of successful boundary spanners can be found in an article written by Tom Mulhern and Dave Lathrop, of Conifer Research and Steelcase Inc., respectively. Their article,“Building and Tending Bridges: Rethinking How Consultants Support Change,” detailed the way in which design consultant Conifer Research used its methodological expertise in furniture and workspace design to improve Steelcase’s product innovation and organizational performance. Although Mulhern and Lathrop had not worked together before, they had “worked around each other” and knew a lot of the same people. They were both part of an established network of relationships and reputation, and this is likely to have facilitated the development of trust between the two organizational boundary-spanners. Mulhern and Lathrop also epitomize the internal boundary-spanner role. Steelcase had previously gone out of its way to seek external perspectives from a “host of brilliant, innovative, but generally outside resources, with the outcome generally packaged as a ‘deliverable.’” But in order to achieve the impact they sought, Mulhern and Lathrop recognized that their job would be to inspire insiders to take up the cause. They described this process as developing “experience bridges.” The bridges they established linked people, information, and process and thereby “dramatically accelerated” progress through the development of shared understanding. In conclusion, it seems as though a strategic alliance between a large corporation and a small creative house works effectively for product innovation, with the role of the boundary spanner being crucial to the success of this approach. This is a comprehensive study of the introduction of an automatic washing machine, the World Washer, into the Indian market, by Whirlpool Corporation in 1990. Conceived as an important part of Whirlpool’s global strategy in the late nineteen eighties, it was designed for the emerging markets of Mexico, Brazil and India. It failed dramatically and resulted in Whirlpool having to purchase obsolete twin tub technology from Korea for their next product launch in India. This paper attempts to describe the existing market at the time of the launch 1988-1990; Whirlpool’s global strategy and the part played by their design departments; the intersection of strategy and design; and, to analyze the reasons for the World Washer’s failure. The majority of industrial designers in studios and corporate departments around the world are tasked with the design of a specific product or application, isolated contextually, for the most part, from the larger ecosystem of the market primarily due to their experience of and immersion in the existing sophisticated marketing infrastructure. They have the luxury of access to information flows on packaging, distribution, supply chains and retail outlets as well as competing designs and this lets them focus on refining a particular product, package or UI. This situation is almost reversed when it comes to the BoP consumer and the BoP markets. The paucity of information does not only hamper the BoP themselves but also those who seek to serve them. Furthermore, much of the market infrastructure is non existent or of a vastly different quality than that experienced in richer markets. Factors such as income streams that are irregular and lack of financial tools such as consumer credit available for outright purchase are issues rarely considered during the design process but can and do influence the final outcome. Products designed in isolation may win awards but may never quite impact the quality of life in the manner they were designed to do so if their business model, pricing or payment plans, much less distribution or usage do not reflect the conditions of the operating environment. The issue of pricing then, becomes mission critical in the design brief but not as a reason to compromise the design. That is, if the traditional MNC approach is top down, stripping features and degrading quality and lifespan achieve no purpose except risking the brand’s reputation. Instead, maximizing the constraints while minimizing utilized resources can be seen as a way to innovate for this demanding consumer segment by providing value through elegant design solutions that appeal yet offer a return on their investment. Whether its as basic as availability of electricity and running water or as subtle as the design interpretation of such underlying value propositions as “convenience”, the assumptions made about consumer buying behaviour, purchasing patterns and decision making or choice of brand or product cannot go undebated or unquestioned. A challenging environment, conditions of uncertainty or scarcity and the hardships of daily life managed on irregular incomes all serve to influence the value system and mindset of the target audience in ways we are not always able to immediately discern if we don’t flag our implicit assumptions as a potential stumbling point. These markets are not the already saturated mature ones of the “global village” with a blase attitude towards such throwaway things as the use of religious iconography on lunchboxes and t-shirts, still preferring to stand on their dignity and self respect over the sophisticated acceptance of perceived disrespect. Thus, nuances observed during user research that may be overlooked when considering different regions within the developed world may in fact be far more important in the context of BoP consumer markets and influence the user acceptance and adoption rate of the product or service. Choice of colours, features, tone and style of communication are some of the design elements so affected. Choosing to tread as delicately as a newcomer never hurts. Respect matters. Before we can give form – and it does not have to be a tangible product but could even be a service, a business model or a strategy – to what we wish to do, its not enough to step back to just the function level, one must step even further back to envision the whole before one can even begin to pinpoint what the requirements are. And before we can envision the potential solution space within which the requirements can be framed for the ultimate manifestation in the form of design, we must understand not only the what and how but also the why, when and where.The most powerful concept in this diagram, imho, is the fundamental importance given to ‘understanding’. Without understanding – which in this sense could be seen as ‘grasping or grappling with the big picture’ – one cannot begin to envision or see what the possible directions or paths that ‘form’ or ‘function’ can take. Without the big picture view, the perspective into which all the disparate bits fall into – if not falling into place, then at least within understanding or at least coming to terms with – we cannot see far enough ahead in order to shape or manifest tangibly any plan of action or even, next steps. I have said before that I believe that design is inherently a philosophy or a system of values first, and it’s implementation, in whatever form, second. Understanding the ecosystem in which your actions will take form comes first, which then leads to vision – only then can you begin to get down to the brasstacks of framing requirements and finally the design. We very often jump straight to the design – or the action – and this hierarchy of the steps required prior to any design is a useful reminder of the other 90% of the iceberg. This approach has been the basis of my work in the little known geographies and the uncertain conditions of the emerging consumer markets of the developing world. This wave of “agile innovation” poses a new set of challenges for designers, as many of the tools of design are already in the hands of entrepreneurs and engineers. Designers can’t wait to be “hired” to enhance or improve these offerings. We must be active participants at their inception. If designers are truly skilled at identifying unmet human needs and creating the breakthrough products to address those needs, then, increasingly we will need to prove our value as entrepreneurs. American designers can and should lead the way in showing how you adapt the design process to rapid, real-time product development. And lead the way in demonstrating what can be achieved by designers as entrepreneurs in our own right. Ten years from now I hope to see designers able to attract VC capital at the same rate as MBAs and software engineers. That is the next big mission for American Design. Amazingly, just a few months later, we have this Reuter’s piece In Silicon Valley, designers emerge as rock stars (though its publish date is Friday the 13th of April, not the 1st). Five years ago, Justin Edmund arrived at Carnegie Mellon University, a floppy-haired freshman, with artistic talent and dreams of joining a venerable design firm like IDEO or Frog. But during his sophomore year, a recruiting pitch from a Facebook employee turned his head, and prompted a detour of his ambitions. Edmund isn’t alone. Inspired by the legacy of Steve Jobs and lured by the promise of the current tech boom, young designers are flocking to Silicon Valley, where they’re shaking up a scene long dominated by engineers and programmers. Last year, McClure put down money to create the Designer Fund, a program that identifies entrepreneurs with strong design backgrounds and offers seed money and mentoring from experienced founders like Putorti and Chad Hurley, of Youtube. The fund, headed by Enrique Allen, a 25-year old graduate of Stanford’s design school, has partnered with more established venture investment firms like Khosla Ventures, Andreessen Horowitz and Kleiner Perkins. “We’re reshaping a lot of how you build a company,” McClure said. But, he added, “there’s still a resource and talent shortage” for interaction designers. It certainly doesn’t hurt to have code jedis at the helm of your starship, but engineering for consumer Internet startups need only be competent. The real challenge is finding designers and product managers who can build an awesome product experience, and marketers who can figure out effective, scalable, integrated distribution strategies (whether organic or paid, whether technical or creative). So are these two clusters of highly intelligent people simply talking past each other, or has the design industry indeed aged and faded to the extent that they’re unaware of what’s happening in the cloud around them? From the perspective of someone who was once actively thinking and writing about design, from a desk on a hill in San Francisco, just five years ago (when Justin Edmond arrived at CMU in fact) it seems that American design has a bigger problem they face today – that of still living in an echo chamber whilst gazing at their navels. Man, even I’ve archived those posts on a dusty WordPressed shelf and moved on to the next frontier. Once upon a time, Fast Company was as edgy as Wired in the heydays of “make it look like Wired” but today, it seems to have become the “business strategy” thinking designer’s bulletin board.